The graduate talent pool expands over summer and the best graduate jobs are snapped up quickly. 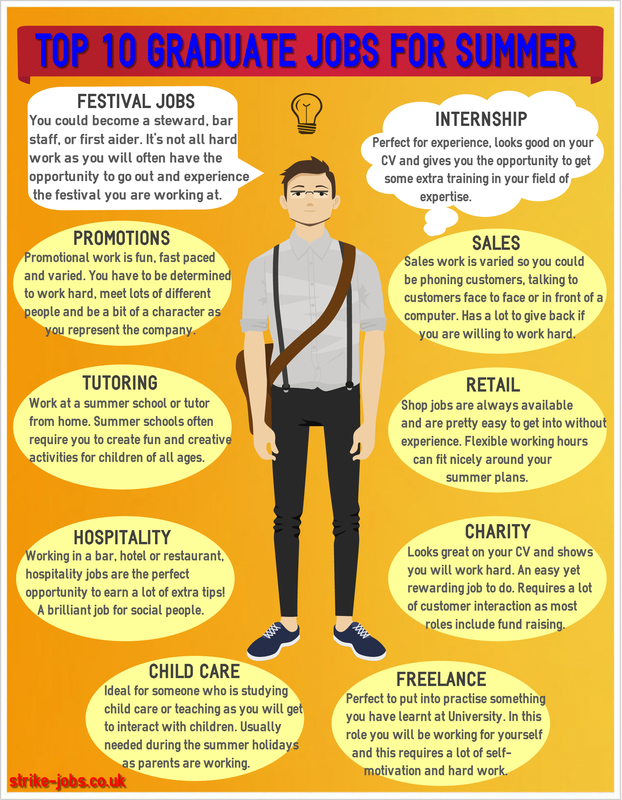 But don’t worry, here is Strike Jobs guide to the best graduate jobs for summer. Graduates, be prepared for a busy summer that will guarantee to pack your CV with some fantastic experience, but also be prepared to work for free. There are many graduate programmes, graduate management schemes and part time summer jobs available for a wide range of skills. Often it’s a great way to pocket some money over the summer and have some fun while you’re not studying. Internships can be either paid or unpaid. Mostly companies offer summer temp jobs which do not require you to have any previous experience and they offer full training. They are great to bulk up your CV and give you some work experience. Getting an internship in the sector in which you are studying will allow you to put your study to practise. An unpaid internship/work experience could lead to paid work with the same company in the future if you work hard and show you are willing to take on a temporary summer job during your time at university. Promotional work is fun, fast paced and varied. Promotions often rely on your personality rather than experience so it is ideal for those who are looking to gain experience. Promotions have a high turnover of part time summer jobs so are always keen to take on graduates. You have to be determined to work hard, meet lots of different people and be a bit of a character as you represent the company. with the company after the summer you may get the chance. This type of job is ideal for those wanting to go into teaching or something similar, although most graduates can apply. It provides great experience. There are jobs available at summer schools or you can tutor from home. If you are working for yourself it might help you brush up on your time management and patience. Summer schools often require for you to create fun and creative activities for children of all ages. Although a DBS check may be required as you will be working with children. There are a lot of part time summer jobs and this is a broad category. You could become a steward, bar staff, or first aider. It’s not all hard work as you will often have the opportunity to go out and experience the festival you are working at. Shop jobs are always available and are pretty easy to get into. Quite often big chain shops are keen to enlist students on graduate management schemes so there is a great opportunity to work your way up through the business while you enjoy your summer. The hospitality sector is varied, there are a large number of part time summer jobs available and they are advertised so often. As a graduate they may value your strong work ethic. Most of these jobs will require weekend and evening work so you will get a lot of free time. Temporary summer jobs are easy to get into if you are friendly and keen to work hard. These jobs often include travelling, and are customer based. Often they are seen as some of the best graduate jobs as they are easy to get into and require some hard work, which will shine through on your CV. This role is similar to tutoring as you are caring for children and will require a DBS check. This is a good summer job to have if you’re studying childcare or teaching. Quite often you are required to work on weekends and evenings or sometimes while parents are at work during the day as the kids have a long summer holiday. If you are a writer, journalist, IT worker, designer, artist, or similar you could start freelancing. In this role you will be working for yourself and this requires a lot of self-motivation and hard work. However, the more work you put in the better results you will get back. So, graduates, as you can see there is plenty of opportunities out there for the summer. Visit Strike Jobs and find a graduate summer job now! This entry was posted in Top 10 Jobs and tagged bar, charity, childcare, cv, festival jobs, freelance, fundraising, graduate, graduate jobs, hotel, internship, Jobs, nanny, Promotions, restaurant, retail, sales, shops, strike, strike-jobs, Strike-Jobs.co.uk, summer graduates, summer jobs, summer school, tutoring, work experience. Bookmark the permalink.